grounds at the hotel. They have sprouted and he is looking for an ID. Ideas? Did your friend say what colors the ?berries? were which enclosed the seed? All I could say is that is looks like one of the birdsnest types to me. > at the hotel. They have sprouted and he is looking for an ID. Ideas? > A friend collected some seed from this Anthurium while in Cancun. I suspect it was just planted in the?garden as he said there were many around the grounds at the hotel. ?They have sprouted and he is looking for an ID. Ideas? If it produced berries and the species is A. hookeri they will be white, not red. 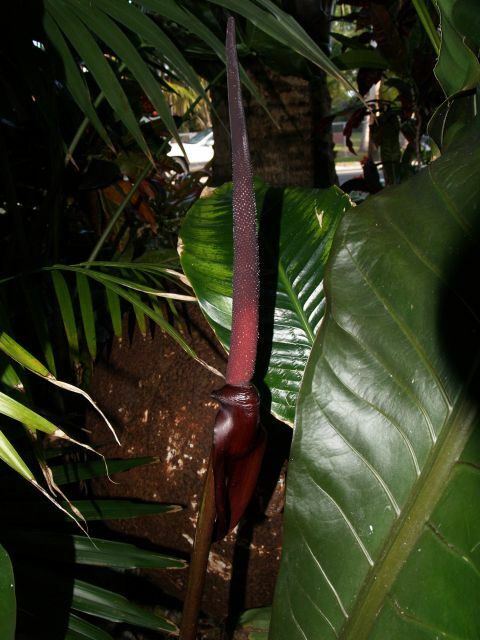 > A friend collected some seed from this Anthurium while in Cancun. I suspect it was just planted in the garden as he said there were many around the grounds at the hotel. They have sprouted and he is looking for an ID. Ideas? Could be A schlechtendalii, but the leaves look a bit more ruffled than mine. Spadix and berries also look similiar. A friend collected some seed from this Anthurium while in Cancun. I suspect it was just planted in the garden as he said there were many around the grounds at the hotel. They have sprouted and he is looking for an ID. Ideas? to tell with the amount of information one can get from these picture. the grounds at the hotel. They have sprouted and he is looking for an ID. This is Anthurium schlechtendalii Kunth. mine. Spadix and berries also look similiar. looking for an ID. Ideas? mine. It does have red berries and the inflorescence looks correct. Just a note about this plant which might assist, it is available commercially, and I just noticed that at the holding area of the Company where I work (we do commercial landscaping installs) we presently have a couple dozen potted specimens of plants exactly like these purchased from a commercial grower, I`ll ask where and what they were called. Anthurium ''ruffles'' comes to mind, but that name probably has no horticultural value. > Thanks Tom, I was thinking it could be but it looks very different from mine. It does have red berries and the inflorescence looks correct. > This is Anthurium schlechtendalii Kunth. Harry, I think Anthurium 'Ruffles' is an A. plowmanii. Surf on to the classic Tropicos3 and search Anthurium giganteum, images. There are several variations on this theme. I have a form that looks similar,but has narrower sinuses...I have been looking at photos of plants in habitat and there seems to be a species complex associated with populations of closely related taxa. Does your plant set seed? I have not been able to set seeds on this and some other large growing species...but, I have only recently been interested in pollination of my Anthurium. I need to learn techniques and timing...I am trying only to self...not hybridize, at this point. I'd be interested in your opinion after you check out the Tropicos images and the comparison to your plant. > but can't be sure. But I have never had an ID for it. unlabeled cutting years ago from Brian Williams. Surf on to the classic Tropicos3 and search Anthurium giganteum, images. populations of closely related taxa. am trying only to self...not hybridize, at this point. and the comparison to your plant. > I have never had an ID for it. Thank you for your inquiry. 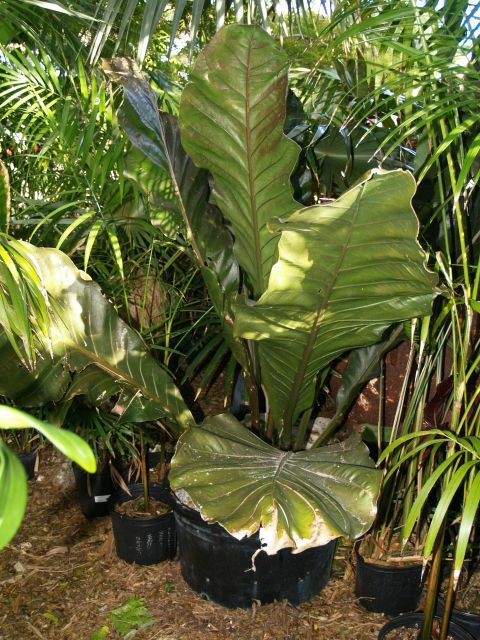 I have a large growing plant which is similar to Anthurium giganteum in general...but with a narrower sinus, etc. I may also have an Anthurium balaoanum. My collective vein starts at about the 4-7 basal vein...I could not see yours. I read Steve's article on Anthurium balaoanum and it seems to match my plant somewhat. I will also assign a tentative identification. It is difficult these similar species...from photos and plants without data. My plant was purchased as a cutting and was sold to me as Anthurium regale...which it is not. Two other cuttings, also sold as Anthurium regale,are some other species which I have not identified. No data...and I have no clue yet. The only common denominator in all these is their large size. > unlabeled cutting years ago from Brian Williams. > I think I will tag it for now as Anthurium aff balaoanum. > populations of closely related taxa. > am trying only to self...not hybridize, at this point. > and the comparison to your plant. > > I have never had an ID for it. I am answering myself a bit. 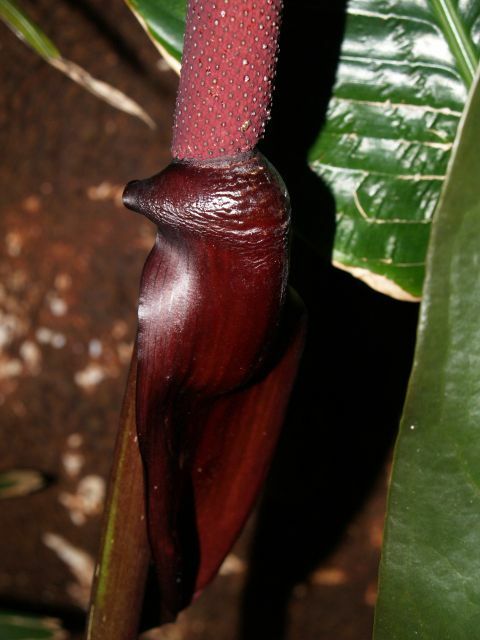 I just read a little further down on Steve Lucas' article on Anthurium balaoanum where the spadix is described as maroon turning to brown...my spadix is a yellow green...if my memory is serves me correctly. The inflorescence is held erect. > Anthurium balaoanum and it seems to match my plant somewhat. > > unlabeled cutting years ago from Brian Williams. > > populations of closely related taxa. > > am trying only to self...not hybridize, at this point. > > and the comparison to your plant. > > > I have never had an ID for it. > > > Checked by AVG. Leland, can you possibly post a photo of your inflorescence? I took the description of the inflorescence from Dr. Croat's field notes and have not seen an inflorescence on any of my four plants. My plant is past blooming this year, I believe...but I will do so. I think my plant must be something other than Anthurium balaoanum, if Dr. Croat's notes on the spadix are correct and diagnostic. > Leland, can you possibly post a photo of your inflorescence? > I took the description of the inflorescence from Dr.
> on any of my four plants. > me correctly. The inflorescence is held erect. Leland, your knowledge of aroids far outweighs my own but I thought everyone who is an Anthurium enthusiast might like to read some of Tom's notes taken from TROPICOS. 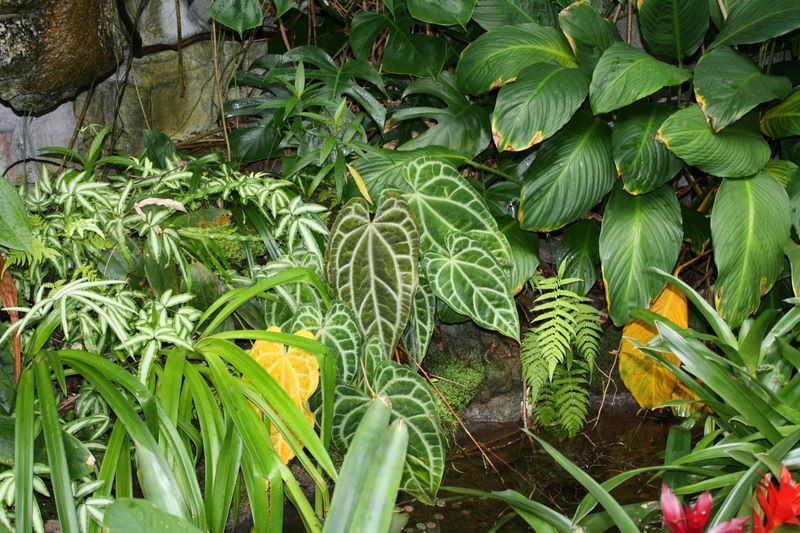 Perhaps you can compare these to your plant and determine if your specimen is truly Anthurium balaoanum. For those unfamiliar, the numbers at the beginning are Dr. Croat's specimen numbers. Tom once explained in a series of personal emails that many people believe Anthurium balaoanum is Anthurium guildingii. A. balaoanum is from Ecuador and Anthurium guildingii is from the lower eastern Caribbean and as you know both plants are very different. #53706 Internodes short, 1.5-2 cm diam. ; the roots ca. 5 mm diam., mostly directed downward; cataphyll lanceolate, 3-4 cm long; petiole 3-sided, broadly and sharply sulcate adaxially, sharply angular abaxially, the ridge usually markedly asperous; geniculum ca. 1 cm long; blades coriaceous, dark green, matte; the midrib narrow, obtuse, the lateral veins obscure; the lower surface slightly paler; the midrib sharply acute, prominently raised; the primary veins moderately obscure, slightly darker than the surface; inflorescences erect; the peduncle terete, asperous, tinged purple; spathe green, reflexed-spreading, moderately thin; spadix maroon turning brown, the pollen whitish. #50719 Epiphytic; stem to ca 1 m long, internodes 1-1.5 cm long, 1-1.3 cm diameter; cataphylls deciduous; petiole terete; sterile; flowered in cultivation, spathe absent, spadix sessile, yellow-green, broadly arched, more or less tapered, stamens exserted, pollen pale yellow. #73144 Terrestrial; internodes dark green; petioles obtusely flattened and weakly sulcate; blades subvelvety and weakly glossy above, much paler and glossy below, midrib acute and concolorous above, round-raised below; inflorescence erect; spathe green, deciduous; spadix yellow-green, moderately glossy. #90395 Stems elongated to 1 m long; internodes short 2 cm diam. ; petioles subterete, obtusely and weakly sulcate, weakly glossy, weakly flattened toward base; blade thinly coriaceous, dark green and matte-subvelvety above, slightly paler and weakly glossy below; midrib narrowly raised, bluntly acute, slightly paler above, narrowly round-raised and moderately paler below; primary lateral veins weakly paler, acute in shallow valley above bluntly and narrowly raised, paler below; tertiary vein in part weakly raised. What would be important...and I am going to let you do the initial investigation...can you tie the collection numbers to locality data? Just from reading the field notes...either Anthurium balaonum is a plastic, variable species...specifically the petioles and spadix color, etc. are different in the specimens listed. My plant has characters that fit several of the notes,and not others. My petioles are subterete and weakly sulcate on the adaxial surface. My spadix, if memory is serving me, was yellow-green...not maroon at male anthesis...which the first specimen(#53706) is described as having...since the pollen is noted in this field observation. When my plant next blooms, I will pay closer attention to details...as I really have only taken passing notice until this species became a subject of discussion. Please connect the locality data to the numbers and whatever other details you can ferret out. > to read some of Tom's notes taken from TROPICOS. > as you know both plants are very different. > spadix maroon turning brown, the pollen whitish. > tapered, stamens exserted, pollen pale yellow. > raised, paler below; tertiary vein in part weakly raised. > are correct and diagnostic. Good morning, this Anthurium looks just like the one I posted on the NAS ID center a couple months ago. While I still consider A. balaoanum a distinct species it may prove to be merely an ecotype of A. dolichostachyum. 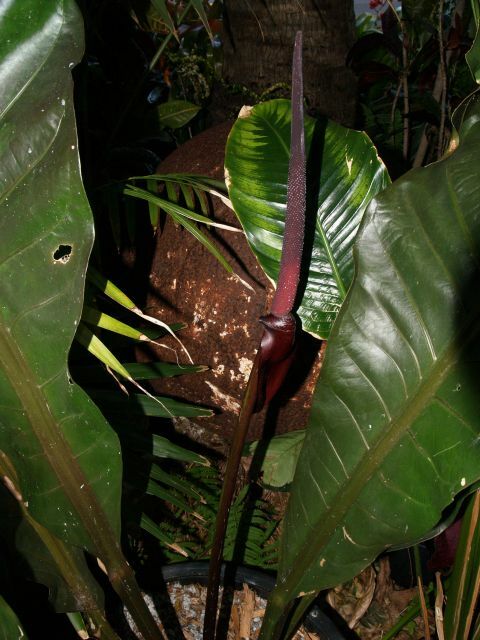 I know it only from the drier parts of Ecuador and it is a much smaller plant with longer, more slender internodes and thinner leaves as well as a smaller, thinner spadix with a very ephemeral spathe. However, no feature is qualatively different from A. dolichostachyum so perhaps the latter species simply has a wide ecological and altitudinal range. Will do. I am printing your note to take with me to Miami to discuss with Dr. Croat as well. I hope a bunch of you will be in Miami! We leave tonight. Thankd Tom. We had discussed this briefly in your office two years ago. I have printed off the information I have published as well as this note along with Leland's to bring to Miami. Hopefully we can find time to sit and allow you to explain all this in more detail so I can clarify the information on my site. Glad you're back for Europe and I'll see you in just a few days. even A. magnificum, but I am not expert enough to tell the difference. a square section, as opposed to round in A. crystallinum. ears than body, like an alien. opposed to round in A. crystallinum. A. clarinervum is much smaller, with lvs. almost wider than long. More ears than body, like an alien. expert enough to tell the difference. ven A. magnificum, but I am not expert enough to tell the difference. This one surely looks like Anth. crystallinum or A. clarinervium or maybe even A. magnificum, but I am not expert enough to tell the difference. or maybe even A. magnificum, but I am not expert enough to tell the difference. This is A. clarinervium. Rhe leaves can become 35 cm long! the plant is a dwarf. It produces orange fruits. culture as Anthurium 'Crystal Hope' which may be a mutation of A.
crystallinum. The leaves on this specimen are 23 cm. long. See 1890.
this specimen are 23 cm. long. See 1890.
icum the plant is a dwarf. It produces orange fruits. stallinum. The leaves on this specimen are 23 cm. long. See 1890.
ven A. magnificum but I am not expert enough to tell the difference. #1892 is what many in the trade call crystallinum...many of these are in fact primary hybrids. I grow a number of 'Crystal Hope' and it appears to me to be a complex hybrid involving crystallinum. Very compact, rather touchy in cultivation and the contrast light color bleeding off the main veins is quite distinctive and may suffuse almost the entire interveinal tisue. It also appears to have suffered some sort of mutation in TC that makes it clump early on and, like some other plants suffering from this same problem, it is rather difficult to train them to a single lead. I have found that if you can get a single good-sized stem going, they will then exhibit reasonably normal growth. Everybody is saying that the plant in the picture is A. clarinervium but attached, 1892, is the plant I have always known as A. clarinervium. These leaves are 15 cm. long and I don�t doubt they can get much bigger under optimum conditions, but in comparison with A. crystallinum and A. magnificum the plant is a dwarf. It produces orange fruits. Incidentally there is another plant introduced into the trade through tissue culture as Anthurium �Crystal Hope� which may be a mutation of A. crystallinum. The leaves on this specimen are 23 cm. long. See 1890. I am just too weak to go searching. Maybe some other aroid member (Steve?? The Best to all on aroid-l I struggle on. This larger plant (DSCF1890) may be A. leuconeurum or A. magnificum. but attached, 1892, is the plant I have always known as A. clarinervium. under optimum conditions, but in comparison with A. crystallinum and A.
magnificum the plant is a dwarf. It produces orange fruits. tissue culture as Anthurium 'Crystal Hope' which may be a mutation of A.
Nie znaleziono virusa w tej wiadomo�ci przychodz�cej. This larger plant (DSCF1890) may be A. leuconeurum or A. magnificum. Both grow very big. ‘Crystal Hope’ which may be a mutation of A. crystallinum. The leaves on this specimen are 23 cm. long. See 1890.
clarinervium. Rhe leaves can become 35 cm long! leaves and orange berries, is properly named A. leuconeurum. The Best to all on aroid-l, I struggle on. interesting, not to mention confusing. I have to admit that the picture of A.
not the same thing we are both, apparently, growing commercially as A.
very interesting to see what colour the berries are on your plant. This larger plant (DSCF1890) may be A. leuconeurum or A.
magnificum. Both grow very big. article which Steve has posted and will nudge him about the Croat article. info. you and others need, one an article by John Banta, another by Tom Croat. Steve will get the info. to you soon. from Aroideana Volume 6, number four on Anthurium leuconeurum. of the homepage. There is a slight charge for larger articles. prepared no voucher in the field or if he did it has not survived. compares relatively well with the type plate (Fig. 1) of A. leuconeurum. with members of section Schizoplacium. by John Banta which has led to the conclusion that A.
and to publish similar articles. The fruits of the species turn pale yellow when ripe. I successfully have grown some plants in generative propagation. Returning to John Criswck's plants I'll try to post the photos today in the ID center. I would like to try to clear up some confusion about the ID of a particular Anthurium. I took this picture in the Missouri Botanical Garden�s Climatron on April 24. The picture located at the link above was a reduced size for web use. I have cropped the Anthurium out of the full resolution image and attached it to this message so everyone can see the plant better. There was some discussion about berry color, which is helpful in identifying species. I think most of this discussion was based around another Anthurium that people were trying to identify. John Criswick introduced this image (http://aroid.org/midamerica/201004images/032.jpg) to the conversation. Concerning the discussion of the picture taken at the Climatron, there is not an inflorescence in that photo. Some people may have misinterpreted a yellow leaf from a neighboring plant as an inflorescence, which is why I am attaching the higher resolution version of the image. It does resemble �Crystal Hope� but I don�t think Crystal Hope would ever put out a long petiole like the one on the right . It is by nature a very compact plant indeed. The seller name was "plant-addict" and it was sold as Anth. bessae � magnificum. Does anyone know this hybrid? Nie znaleziono virusa w tej wiadomosci przychodzacej. Steve Lucas, John Criswick, Zach du Fran and me. was identified by Dr. Croat as Anthurium crystallinum. clear up some confusion about the ID of a particular Anthurium. higher resolution version of the image. nature a very compact plant indeed. "plant-addict" and it was sold as Anth. bessae × magnificum. style="background: rgb(228, 228, 228) none repeat scroll 0% 0%; -moz-background-clip: border; -moz-background-origin: padding; -moz-background-inline-policy: continuous;"
(DSCF1890) may be A. leuconeurum or A. magnificum. Both grow very big. attached, 1892, is the plant I have always known as A. clarinervium. as Anthurium ‘Crystal Hope’ which may be a mutation of A.
Nie znaleziono virusa w tej wiadomo �ci przychodz �cej. Can you identify this gorgeous specimen? I got these photos and I have no idea, maybe it is a hybrid. I have had an Anthurium for nearly 8 year now - bought it when it was smaller but because of the redness of a mature leaf. It has gotten much larger since then but surely would like to be able to place a 'name' to it! The leaves currently are 57 inches long and 17 inches wide. Very similar to Anthurium schlechtendalii but with dark reddish leaves. Spath is red too but have not had seeds at all over all the years - even with 2+ flowers at one time. The more sun it gets, the more red the leaves. Any assistance in identifying this would be greatly appreciated as I have spent HOURS looking at assorted web sites and still no luck(!). No virus found in the message. The plant in the picture is anthurium x Marie. It was breed by Steve Nock In Miami FL. He put it into tissue culture a few years ago and I have been growing it at my nursery ever since. It is very variable from tissue culture and this is the wider leave form of it. It is a very good landscape plant because it can take bright light and also deep shade. In bright light it gets a reddish purple tint to the green leaves but in deep shade it is all green. It is not a large grower and stays medium size. I hope this helps. Anthurium 'Marie', hybridized by Steve and Marie Nock and named for Marie. Google and Google image that and see if it matches. I have no idea, maybe it is a hybrid. bought it when it was smaller but because of the redness of a mature leaf. I saw this anthurium today at the Olbrich Gardens in Madison, WI. It wasn’t labeled. Can anyone suggest an ID? I’m wondering if the yellow berries are in any way diagnostic. The variegated leaf in the second photo doesn’t belong to the infructescence. through a greenhouse growers listserve, but I�m not sure whether it would have gotten up there or not. If it is that species it�s doing impressively well there. I�ll be interested to hear if Tom weighs in on this. variegated leaf in the second photo doesn�t belong to the infructescence. 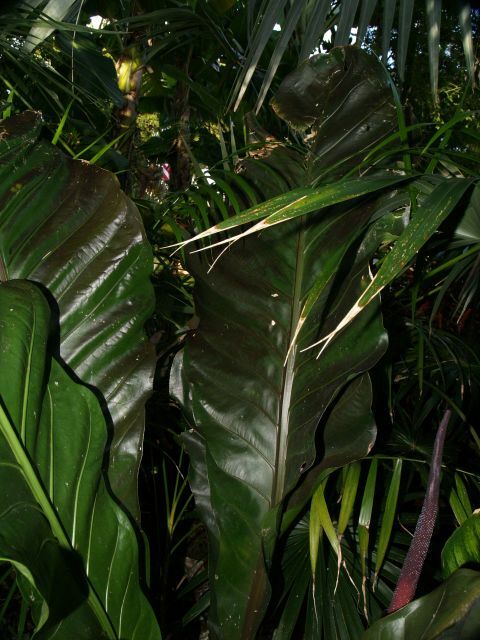 This plant is Anthurium section Porphyrochitonium and probably represents a new species since that section is more than half undescribed. What is Olbrich Gardens? Do they have plants of known origen. Please try to find out more about the origin of the plant. The section ranges from Nicaragua to Peru but most members of the section are in western Colombia and Ecuador. A few species occur east of the Andes, especially in the north of Peru. Only a few species range into the lowland Amazon. Could you send me a heavier image of this plant so that I can magnify and crop the plant. I would like to get a closer view of it so that we could key it out. Unfortunately, I took the photo last week-end as I was passing through Madison (I live in Milwaukee, about 90 miles away). However, I will see if I can contact them for more information. I’m sending you the original photo (1.4MB) to your personal e-mail. Hope it helps. If anyone from your group will be stopping by in the future please have them contact me as I have some unknown anthurium species in the greenhouse that I have collected in Ecuador over the years and would like some identification. Thank you. I�m not sure that we�ve met, though the possibility is there, especially as we�re both members in AERGC. An old directory is how I came up with your email address � I hope that it�s still current. Yesterday a fellow aroid enthusiast posted the two pictures which I have attached, having recently passed through Madison on stopping in at your conservatory. He was inquiring to the aroid group at large as to whether anyone had any thoughts as to the i.d. now, but wasn�t sure whether it had made it up to Wisconsin or not. I know that I�ve met several Wisconsin AERGC players over the years. At any rate, I was wondering if you had any information on this plant that you could pass along. My thanks in advance. Are you guys possibly talking about the same plant that someone sent me recently which was also seen at Olbrich Conservatory that I responded to? Probably not because the plant I saw was Anthurium sect. Porphyrochitonium with orange berries but the coincidence of getting two messages about plants from Olbrich BG in the same week is a surprise. The anthurium in question was purchased from a vendor, Ecuagenera of Cuenca, Ecuador in February of 2007 at the local orchid show, “Orchid Quest”. The label said A. salviniae but it quickly became apparent as it grew in our greenhouses that is was not. The plant was in our growing greenhouses since 2007 and I just planted it in the conservatory this past summer. I haven’t noticed if the fruits turn red but will let you know if they do. We belong to the I.A.S. so I will keep an eye out for any other thoughts on this plant. I’m not sure that we’ve met, though the possibility is there, especially as we’re both members in AERGC. An old directory is how I came up with your email address – I hope that it’s still current. Yesterday a fellow aroid enthusiast posted the two pictures which I have attached, having recently passed through Madison on stopping in at your conservatory. He was inquiring to the aroid group at large as to whether anyone had any thoughts as to the i.d. of this Anthurium. To me it resembles a very well grown plant of Anthurium pageanum, except that the fruits should be red, but maybe they’re still in the process of turning. I think that I distributed that species through the AERGC several several years back now, but wasn’t sure whether it had made it up to Wisconsin or not. I know that I’ve met several Wisconsin AERGC players over the years. At any rate, I was wondering if you had any information on this plant that you could pass along. My thanks in advance. Good Growing. as a small plant, but even at a much smaller stage I can't imagine that it would have been mistaken for A. salviniae. But yes, the conversation is still revolving around the same plant. sect. Porphyrochitonium with orange berries but the coincidence of getting two messages about plants from Olbrich BG in the same week is a surprise. Good, because I thought it would otherwise have been too much of a coincidence. The plant involved is not at all related to Anthurium gracile (Rudge) Shott, a member of sect. Leptanthurium but rather a member of sect. Porphyrochitonium. They have blackish glands on the lower and sometimes upper surfaces. I suspect the plant that they have is a new species and I am interested in seeing a dried herbarium specimen and better pictures. Unfortunate, if they got it from Ecuagenera we may never know where it came from. Sometimes I can get them to tell me about specific plants if I ask them but one always wonders if they are just making it up on the fly. Tom - We are in fact talking about the same plant - I sent the same pictures to John up at Olbrich, so he knew very specifically which plant I was asking about. Perhaps it was sold/bought as a small plant, but even at a much smaller stage I can't imagine that it would have been mistaken for A. salviniae. But yes, the conversation is still revolving around the same plant.